Genuine OEM Xerox Maintenance Kit, 10,000 page yield. Xerox part number: 109R00784. 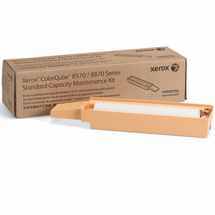 Maintenance Kit compatible with Xerox ColorQube 8570, 8580, 8870. This works 100% as well as buying the product directly from the manufacturer, but at a fraction of the cost. Ink Technologies has prompt on delivery, too.